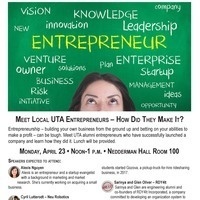 Meet Local UTA Entrepreneurs-How Did They Make It? Entrepreneurship – building your own business from the ground up and betting on your abilities to make a profit – can be tough. Meet UTA alumni entrepreneurs who have successfully launched a company and learn how they did it. Lunch will be provided.